I want to talk about the line between exercising “creative license” and respecting a copyrighted, published work. Do you know that line? Have you ever encountered it? Have you ever crossed it? I ask these questions not to condemn or chastise, but to generate awareness and to strike up what I believe is an important conversation. I ask it because I don’t believe that anyone has ever asked me, and because I’m likely culpable myself. Honestly, though, have you ever even thought about that line? Working on a show, or perhaps in a class, have you ever haphazardly chosen to cut a portion of a text that just didn’t seem to fit? A problem that was easier to avoid and ignore than to engage with? That’s the line. If you’re not familiar with Cloud 9 (or Caryl Churchill), I recommend getting to know them both. This New York Times review is a great resource for “getting the gist” of the play, or you can purchase the text through Samuel French here. Crucial to the exploration and illumination of the play’s themes are Churchill’s specific notes on character. Not only do the actors play more than one role, but they play a different member of the family in each act, and they often play opposite their gender or race. In the original production, the wife and mother, Betty, was played by a man in colonialist Act 1, then played by a woman in the liberated world of Act 2. 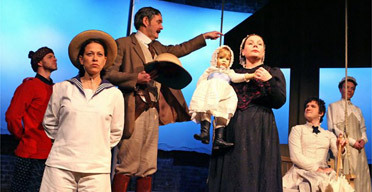 Similarly, the actor playing Clive, the husband and father who is unnaturally hard on his homosexual son Edward (played by a girl), takes over the role of Edward in Act 2. Consider the messages … Churchill’s orchestration of these characters and actors creates a brilliant picture for fully realizing and communicating the play’s themes. In a recent production that I saw, however, these careful orchestrations were not followed. Betty was played by a woman in Act 1 and a man in Act 2 – the exact opposite of how the characters were originally written. And the actor who played homophobic Clive in Act 1, went on to play his daughter, rather than his homosexual son in Act 2. Consider how the messages might change … The list went on and on, and the result was a rather confused telling of the story that lacked any real consistency or illumination. For whatever reason, the line was crossed. The playwright’s work was compromised. The end result suffered. We live in a world where adaptations and re-imaginings of old classics are everywhere, and I firmly believe that public domain works are a fabulous thing. They provide a truly exceptional creative outlet, particularly in educational settings, for all manner of artistic exploration, and they provide a vehicle for artists to think outside of the box and experiment with their own personal aesthetics. But these kinds of works are unique. The ways in which we are allowed to engage with them, the set of rules (or lack thereof) that apply, simply are not the same for copyrighted works. We cannot turn everything into theatrical silly putty simply to satisfy our own artistic tastes. Or worse, because it is convenient. We need to continue to question our artistic decisions and their repercussions. To expand our awareness of this line. As actors and theatre practitioners, we need to work to fulfill the needs of a play, rather than doctoring a play to suit our own personal needs. We owe it to the playwrights who gift us these great plays to respect the lines they draw for us.